Fifty years ago, Jewel B. Long stepped onto Hampton University’s campus hoping to become the Hampton woman that she is today. Long loaded her belongings into Stone Manor for her freshman year, not knowing that she would later become a memorable part of Hampton University’s legacy. “My mother told me that I could go for my first semester, but she was not sure how the future semesters would go because we did not have any money,” said Long. Long did not let the financial burden stop her from receiving an education from her Home by the Sea. During her first semester, Long used work study to offset the $2,000 needed for tuition. Long was assigned as a student clerk-typist in the Office of Student Affairs, now known as the Office of Student Activities. In her junior year, Long became a resident assistant for Stone Manor. “Another resident assistant and I shared a room in 316,” Long recalled. Junior year brought out many opportunities for Long to make her mark on Hampton University’s campus. During Long’s last year as a graduate student, she served as a Graduate Assistant for the Director of Student Activities and the Dean of Students. Long later went on to become a Residence Hall Director and the Assistant to the Dean of Women. In 1988, she earned the title of Dean of Women. 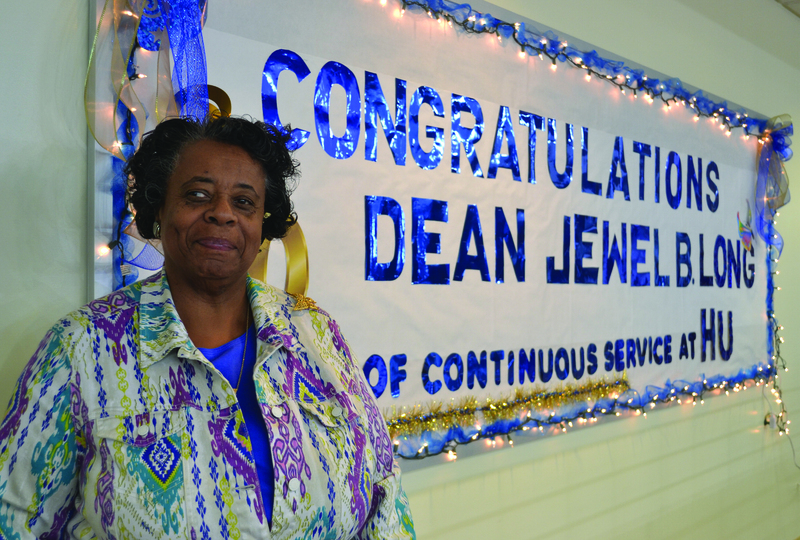 Long worked as the Dean of Women until July 2015 when her title changed to Dean of Residence Life. “When people in the department start telling me about their difficulties with their positions, it’s easy for me to tell them ‘Yeah, I’ve done that. It may be a challenge, but you can master it,’” said Long after listing all of her previous titles at Hampton University. Community service and giving back has always been a large part of Dean Long’s life. She plans to continue serving the Hampton Roads area by volunteering her time with a cancer support group. “I hope that when I do decide to retire that I’ll still have an opportunity to do my service,” said Long. “I hope to either be a hospital ombudsman or a patient advocate so that I can help be a voice for them.” Long calls her commitment to serving others a gift. Dean Long continues to build nurturing relationships with Hampton alumni and current students of the university. “I have the pleasure of telling students that I know their parents. Often times they don’t believe me,” joked Long. “I’ll have students come back from Thanksgiving break telling me that they asked their parents about me and the parents will know exactly who I am.” Long says she loves to watch the students’ growth in themselves and in their families as adults. She calls her time at Hampton “a rewarding experience,” but it is not over yet. Long believes that there is still work to be done at the university. As she watches more students matriculate through the school and mature into Hampton men and women, Long notes that people are like her favorite creature, the butterfly. “We are all in a state of becoming the best people we can possibly be,” said Long. “The only one’s who are not in that state are the people who think they’re already the best.” Long plans to learn as much as she can from her newest title, while teaching others to reach their full potential along the way. I have had and still do have the pleasure of working under her and she was not only my Boss but my mentor and now my Friend! CONGRATULATIONS YOU DEFINITELY DESERVE IT!